Description Lake Inle is a relatively shallow small mountain lake in southeastern Myanmar, which was formerly Burma. 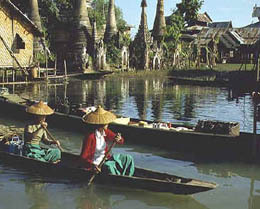 Lake Inle is fished mainly for the local carp, which is traditionally captured with a special device consisting of a conical frame holding a gill net. Carp fishermen forage over the lake from canoes, standing and rowing with a long paddle manoevered with one foot and supported against the hip. The fisherman locates the fish by sight and places the frame over the fish, who is then chased into the gill-net with a spear. Currently, however, monofilament gill nets are widely used on the lake. Issues Lake Inle's health has been degraded by a wide range of conditions including cattle grazing; pesticide, fertilizer and sewage runoff; and extensive alteration of the lakebed. In some places the lake is only canals between gardens or farm plots. Two large invasive fish species have been found in Lake Inle, Grass carp (Ctenopharyngodon idellus) and Labeo rohita. Description Lake Inle has an unusual number of species that exist nowhere else in the world (endemics). The lake is home to over 20 species of gastropods (snails) of which many are endemic, and endemic fish species such as the Inle swamp eel (Chaudhuria caudata) and the Inle barb (Sawbwa resplendens). Two cyprinid genera (Sawbwa and Inlecypris) and 16 of 31 species appear to be endemic to the lake and its tributaries.